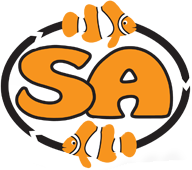 The SA Fancy Clownfish, Amphiprion ocellaris, is a variety of the common orange ocellaris clownfish developed at Sustainable Aquatics for its additional black coloration in the fins and body along with a deep red/orange body color. These fish develop a very distinct black outline or trim on all of the fins that distinguish them from other designer varieties or the normal orange ocellaris. The color patterns of the SA Fancy Clownfish are evident from a young age, but they also continue to develop dark coloration around their stripes as they mature. Care for the SA Fancy is the same as for other varieties of ocellaris clownfish.